Category design is the discipline of creating and monetizing new markets in a noisy world. The journey starts with understanding the problem that you solve. The problem is the proxy for the category and is the strategic missing you see in the world. That unsolved problem is what keeps you up at night and drives you to build a product, company and category to solve it. Category design has existed for decades. In fact, many of the greatest category leaders have been practicing this discipline at an instinctual level. These legends made sure that the world understood why their breakthrough innovations mattered. They educated the market about why they should consider doing things in a new way with a new product. They intuitively lead their markets by teaching customers why they should abandon old ways and embrace the new world. Identify the problem: Articulating the problem and your unique technology or market insights is the first step of your category design journey. Define the category name: Defining the name of the category is a big step to helping the world understand the container for the problem. The category name is often comprised of the market type, the nature of the problem, and the audience who has the problem. It’s a name that will evolve over time as your category expands. 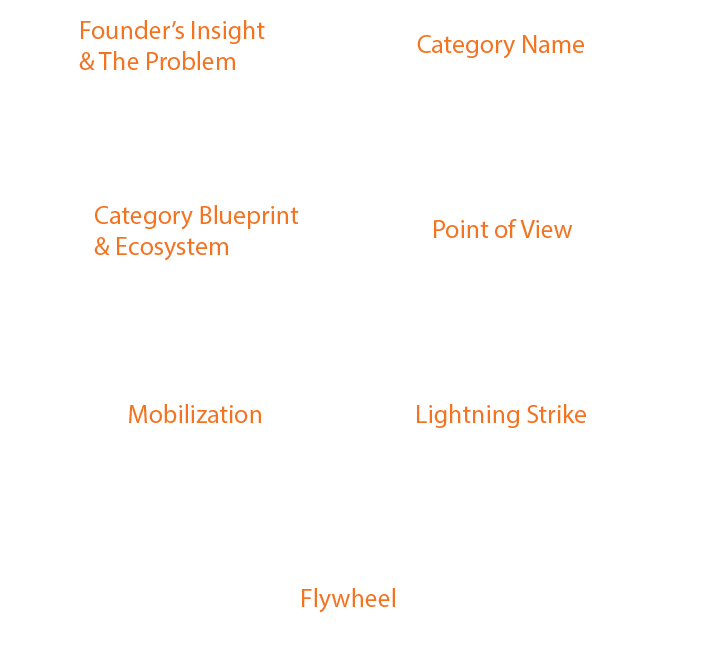 Publish your category blueprint and ecosystem map. Sharing your category vision requires a visual blueprint and ecosystem that maps out the people, processes, and products required to fulfill the category potential. Your blueprint represents what solution you have today and what you will build in the future to solve the category problem. Create your point of view. Sharing your category vision with a powerful point of view (POV) is the next step. Your POV frames the category problem, explains the ramifications for not solving the problem, presents your vision for the future, and declares your unique answer to the problem. Mobilize the entire company. One of the most powerful steps in category design is mobilizing the entire company, and in some cases the entire industry, to solve the category problem. Mobilization is the step that unifies every single person in your company around your company, product, and category goals. Execute Lightning Strikes. Lightning Strikes condition the world to see what you see. Lightning strikes target the cognitive biases of the entire category ecosystem helping you to anchor your agenda, create group-think, drive conformity and commitment to picking your company as the category king. The Lightning Strike playbook aligns every function of your business to work together as a signal unit in a concentrated period of time. Spin the Flywheel. Your category journey is ongoing and your category flywheel will gain momentum with every lightning strike. This flywheel allows you to expand your category potential, expand the scope of problems you solve, and creates long term unfair competitive advantage.